On October 12, within the framework of the XVII Francophonie Summit, the French-Armenian Development Foundation had the pleasure to welcome the Government of Quebec with the head of Mr. Frederic Dufour. At the meeting Mrs. Maud-Andree Lefebvre, Director of Francophonie and International Solidarity of the Ministry of Foreign Affairs, Mr. Stephane Carrier, Deputy Director General of LOGIQ, Mrs. Marlie Bélanger, International Affairs Advisor and Wüna, graffiti artist participated. 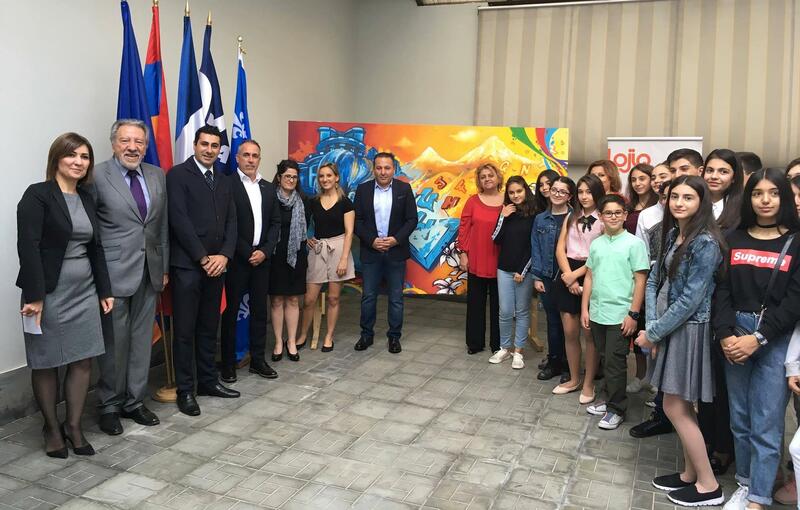 It was a great opportunity to discover the works of the Quebec artist Wüna, 2 of her paintings were generously donated to the French-Armenian Development Foundation and N° 56 school of Yerevan.